Boxcutters, Teaspoons, Jigger, Shaker Classic/Boston, Citrus Juicer, Strainer, Rocks Glass. 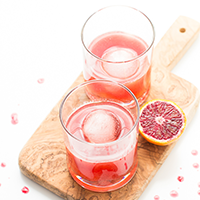 Add bourbon, blood orange juice, water, and honey to a cocktail shaker with ice. Give the mixture a few good shakes. Pour the mixture over ice and top with ginger beer. Garnish with a blood orange slice.